This is the first annotated English translation of the ancient Chinese life sciences text Huang Di Nei Jing Su Wen based on an application of rigorous philological principles. The creative reception of so-called TCM in many Western countries has led to a conceptual and clinical reality that is rather distant from its beginnings in Han-dynasty China. It is through a comparison of today’s realities with these beginnings that a realistic awareness may emerge of the process that Chinese medicine has undergone in its adaptation to the values and requirements of modern times. This translation of a 2,000 year-old text introduces readers to ideas, and their linguistic expression, developed in Han China in the context of the manipulation of the length and the quality of human life so that it might last as long as possible with minimal physical and mental suffering. To permit an easy comparison of this translation with the original Chinese text, a complete reproduction of the Chinese reference text can be found in A Dictionary of the Huang Di Nei Jing Su Wen. 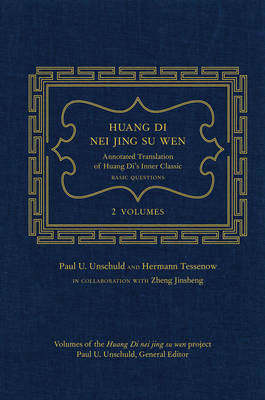 The English translation in the present volumes is consecutively marked by numbers referring to both the historical chapters and the pages and lines of the 1983 Chinese edition of the Huang Di Nei Jing Su Wen.